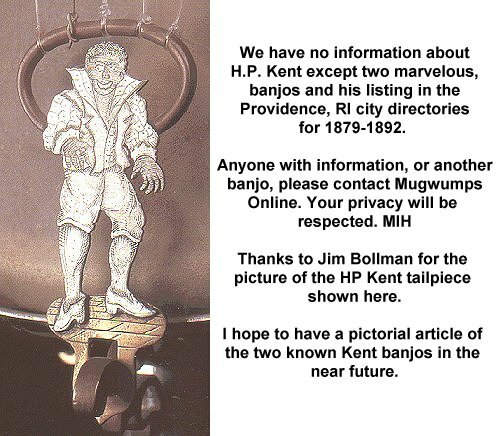 The two known banjos signed by Hexhum P. Kent of Providence, RI, are works of art. They should not be confused with the modern, Asian imports, labeled "Kent" which are at best, entry level, student grade, mass produced instruments. H.P. Kent was in business 1879 until at least 1892 and probably into the 20th century. He is listed in Providence city directories as a "manufacturing jeweler." There is no mention anywhere identifying him as an instrument maker, dealer, performer or teacher. All we have are the two instruments shown here and the listings in the city directories.